The new Sunny Health Obsidian Surge is a welcome addition to the home rowing machine market, as it gives users an opportunity to own a water resistance rower without having to pay a hefty price tag. If you've always wanted to hear that calming whoosh of water while you row, you can now without having to shell out $1,000. 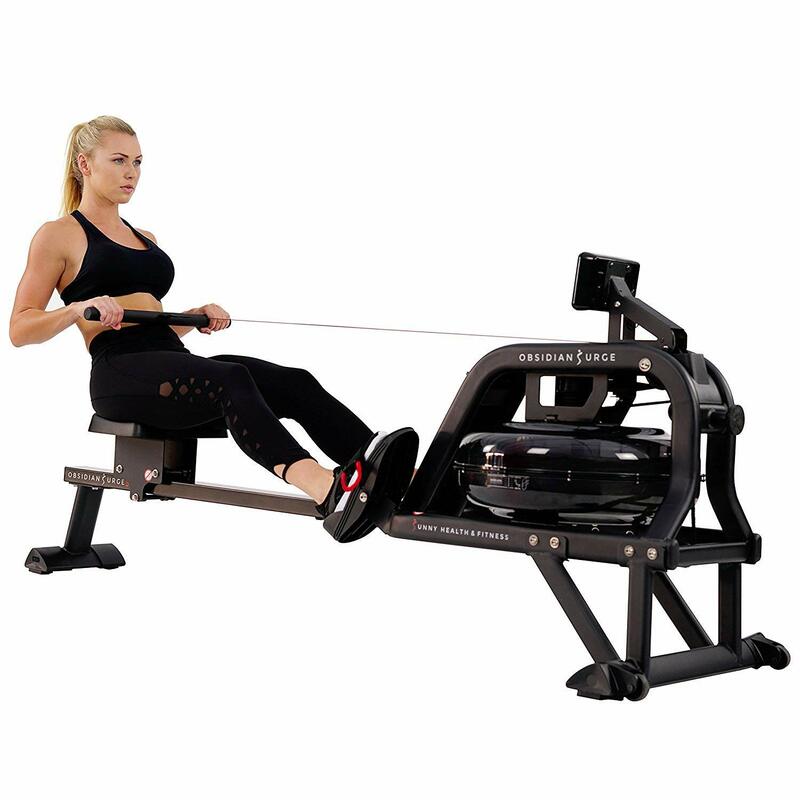 Check out this new rowing machine on sale now at Amazon! There was a ton of buzz leading up to the release of the Sunny Health Obsidian Surge, and early reviews have been very positive. As we mentioned, water rowing machines tend to be the most expensive of all types, and as such they are out of reach for most home users. For example, one of our top picks is the WaterRower Natural, which is one of the lower priced models from the company...but it is still just over $1,000 on sale. First Degree Fitness is another great choice in the space, and those are right around $1,000 as well. There are a few more affordable options on the market, including the Stamina Wave Water Runner, but even at $500 it is still on the pricey side for some. So enter the new Sunny Health Obsidian Surge...at under $400 it is the least expensive water resistance rower you will find on the market. Yet, somehow the company was able to maintain the quality, and there's a decent warranty to back up that quality as well. The overall build of the machine is pretty solid. Although it lists a max user weight of 250 lbs., it should be able to accommodate even more. There are three steel fan blades within the water chamber that create the resistance for you...just like any water rower, the harder you pull, the more resistance is created by the fans in the water. You can change the overall resistance by adding/removing water from the tank, and it comes with a funnel as well as some anti-algae tablets to keep the water clear and fresh. You should pop a tablet in every 6 months, but if you notice the tank getting cloudy you can do it more frequently. There are 6 different water levels to choose from, so you just add the appropriate amount of water depending on how hard you want the workout to be. There's an included siphon pump to remove water from the tank. The Sunny Health Obsidian Surge comes with a large LCD monitor called the R2 Fitness Meter with all of the necessary workout information: time, strokes, distance, pace, SPM, calories and even room temperature. You can choose manual, race or recovery mode, whichever option you prefer. Recovery mode works with a 5.3 KHz heart rate monitor. How Does the Obsidian Surge Compare to Water Rower and First Degree Fitness? You can't really compare the Sunny Health Obsidian Surge to a machine from Water Rower or First Degree Fitness. It's not a true apples to apples comparison. Sure, they are all water resistance rowers, but the Obsidian Surge is more of a residential machine for casual to intermediate users, whereas the WaterRower and First Degree Fitness are more commercial grade for serious users. To give you an example, the maximum user weight on the Water Rower Natural, one of the best machines on the market today, has a max user weight of 1000 lbs. As such it can stand up to the heaviest use by multiple users day in and day out. At a 250 lb. max, the Obsidian Surge would likely not endure similar usage. However, the Water Rower Natural is about 3x the price of the Sunny Health rower. If you don't need something heavy duty, and let's face it most of us don't for home use, then you might just be better off with the Obsidian Surge. As you read about above, it has very smooth, natural motion. It's well designed. It's quieter than other rowing machines on the market, and you just can't beat it for the price. What's the Bottom Line on the Obsidian Rower? 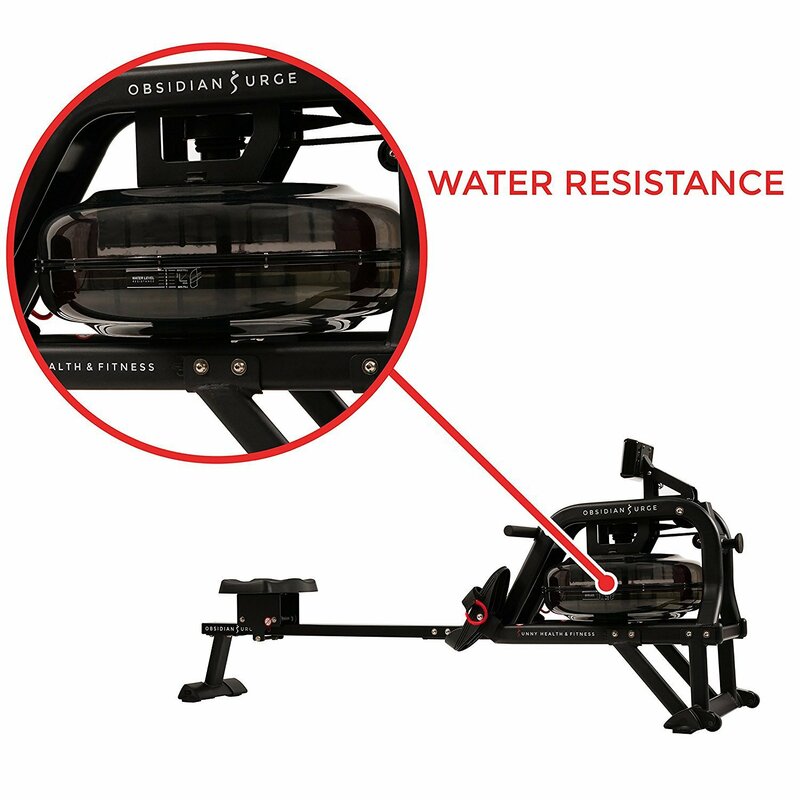 If you're looking for a water resistance rowing machine, and you don't want to spend a fortune, the Sunny Health & Fitness Obsidian Surge is a great option for you. At under $400 it's very affordable, and gives you that same whooshing, relaxing sound as an outdoor row, one of the major appeals of the water rower. Another plus? User reviews have been very positive thus far. On top of the fact that they really appreciate the price and value, they've noted its reliability, ease of set up and comfortable, quiet motion. The one gripe seems to be the foot pedals, and only some people had issue with it. Overall, users have been very pleased. If you're concerned, you can always add a protection plan that will cover you for 3 or 4 years...just for peace of mind. 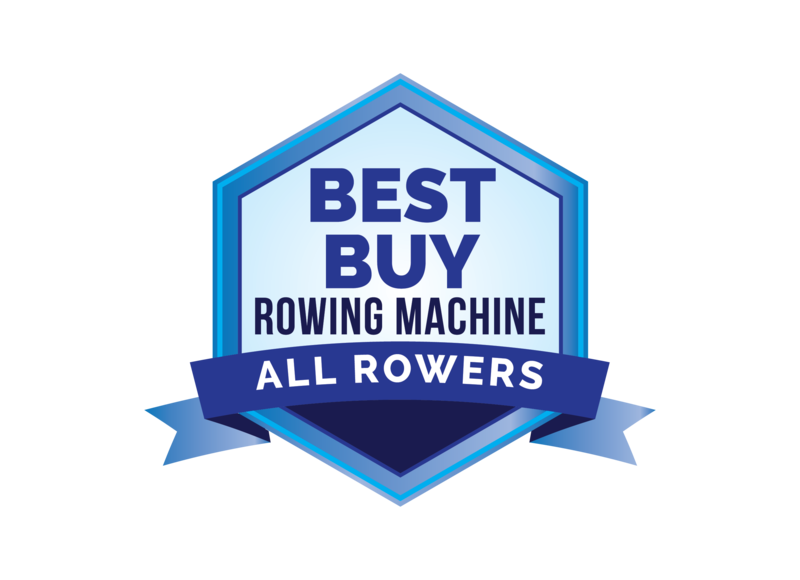 UPDATE: Spring Rowing Machine Sales are now on! The top choice of professional rowers and health clubs, a quality piece of equipment and a great investment for your home gym. The WaterRower Natural rowing machine is a stunning piece of fitness equipment and offers an amazing simulation of the feel of on-the-water rowing. A solid budget model offering great value for the money, with continuous resistance and ergonomic design. Copyright © AllRowers.com ~ All Rights Reserved Trademarks, brands and images are the property of their respective owners.